"The problem with gold: it's easy to get, but it's difficult to get rid of." 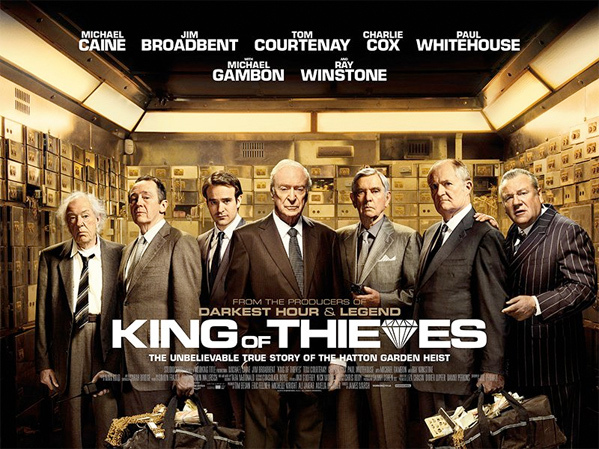 Studiocanal UK has debuted the full-length official trailer for heist comedy The King of Thieves, the latest film from British filmmaker James Marsh (The Theory of Everything, Man on Wire, Project Nim). The film tells the "incredible true story" of the Hatton Garden diamond robbery in London, which took place in April of 2015. A group of retired thieves decide to pull off one of the biggest heists ever in London robbing safe deposit boxes - and they got away with roughly £200 million, but were eventually caught. Michael Caine leads the excellent cast, with Jim Broadbent, Tom Courtenay, Charlie Cox, Michael Gambon, and Ray Winstone. This looks like so much fun, more about the performances and kooky crook characters than anything, but I'm totally up for it. You can still watch the first teaser trailer for The King of Thieves here, to see the original intro to this film. A crew of retired crooks pull off a major heist in London's jewelry district. The darkly funny, incredible true story of the Hatton Garden robbery, the most daring heist in British criminal history. The King of Thieves is directed by British filmmaker James Marsh, director of the films Wisconsin Death Trip, The King, Shadow Dancer, The Theory of Everything, and The Mercy, plus the docs The Team, Man on Wire, and Project Nim previously. The screenplay is written by Joe Penhall, based on the magazine article by Mark Seal. The film has yet to premiere at any film festivals or otherwise. Studiocanal UK has The King of Thieves set for release on September 14th this fall, but no US release date has been set yet. Stay tuned for updates.